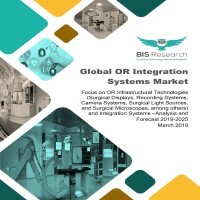 The global OR integration systems market is a multibillion market which consists of a multitude of companies catering to different needs within an operating room environment. Some of the broad segments, the market could be defined under are: Operating Room Visualization Systems, Operating Room Lighting Systems, OR Imaging Systems, and Operating Room Integration Software, among others. OR Visualisation systems and OR Imaging are the two leading segments contributing to 39.6% and 23.2% of the overall market, respectively. The visualisation systems market is primarily driven by increasing surgeon’s demand for enhanced perception of depth during minimally invasive surgeries. The market segment comprises a broad range of products such as camera systems, video systems, surgical light sources, and surgical displays and monitors, among others. The purpose of this study is to gain a holistic view of the global OR integration systems market in terms of various influencing factors, such as regional adoption trends, technological advancements, pricing patterns pattern, among others. The scope of this report constitutes of an in-depth study of the global OR integration systems market, including a thorough analysis of the products across different regions. The market has been chiefly segmented into ‘technology’ and ‘region’. The report presents the reader with an opportunity to unlock comprehensive insights with respect to the market and helps in forming well-informed strategic decisions. The research uncovers some of the substantial parameters that must be taken into consideration before entering into the market. This research report aims at answering various aspects of the global OR integration systems market with the help of key factors driving the market, restraints, and challenges that can possibly inhibit the overall market growth and the current growth opportunities that are likely to shape the future trajectory of the market expansion. The report includes an in-depth examination of the key ecosystem players and key strategies and developments taking place in this market. In addition, the report includes market dynamics (market drivers, opportunities, and challenges) and industry analysis. The research study considers the market share analysis for a comprehensive understanding of the global OR integration systems market and assesses the factors governing the same. Funding scenarios, Porter’s Five Force analysis, patent analysis, opportunity matrix, detailed product mapping, pricing analysis, and growth share analysis by products and by region, has been included in the report. • What are the major market drivers, challenges, and opportunities in the global operating room (OR) integration systems market? • What are the underlying structures resulting in the emerging trends within the global OR integration systems market? • How is each segment of the global OR integration systems market expected to grow during the forecast period and what is the anticipated revenue generated by each of the segments by the end of 2025? • What are the significant developmental strategies which are implemented by the major players in order to sustain in the competitive market? What are the key regulatory bodies controlling the entry of OR integration products to the market? • What are the major OR equipment primarily being integrated in an operating room environment? What is the primary role of different visualization systems in an OR setting? • Who are the leading players with significant offerings to the global OR integration systems market? What is the current market dominance for each of these leading players? • What is the expected compound annual growth rate (CAGR) to be witnessed by the leading players in the market during the forecast period 2019-2025? Which integration systems are anticipated to have the most promising growth? • What are the major technological as well as regional adoption trends pertaining to the global OR integration systems market? • What are the major technologies that are employed in the global OR integration systems market? Which is the most dominating technology? • Who are the key manufacturers in the global OR integration systems market, and what are their contributions? Also, what is the growth potential of each major manufacturer? • What is the growth potential of the global OR integration systems market in North America, Europe, Asia-Pacific, Latin America, and Rest-of-the-World? The key players which have been contributing significantly to the global OR integration systems market include Stryker, Karl Storz, Olympus, Getinge, Arthrex, Canon Medical Systems Corporation (Formerly Toshiba Medical Systems), Skytron, Trumpf Medical (Hill-Rom), Brainlab, Richard Wolf, Smith & Nephew, ConMed, Fisher and Paykel, Haag-Streit, Eizo Corporation, and Leica Biosystems, among others. Figure 5.1: The local Competition, Major Drivers for the Market and Leading Hospitals Pursuing OR Integration in the U.S. Figure 5.5: The local Competition, Major Drivers for the Market and Leading Hospitals Pursuing OR Integration in the U.K. The global OR integration systems market is a huge market (a subset of global OR equipment market) comprising the companies catering to different needs within an operating room environment. Some of the broad segments the market could be defined under are: Operating Room Visualization Systems, Operating Room Lighting Systems, OR Imaging Systems, and Operating Room Integration Software. OR Visualisation systems and OR Imaging are the two leading segments contributing to 39.6% and 23.2% of the overall market, respectively. In 2017, global OR visualisation systems market was estimated to be $3.98 billion and is expected to reach a value of $6.67 billion by the end of 2025. The market is primarily driven by increasing surgeon’s demand for enhanced perception of depth during minimally invasive surgeries. The market segment comprises a broad range of products such as camera systems, video systems, surgical light sources, and surgical displays and monitors, among others. The overall OR integration systems market has been witnessing a steady growth. The market is expected to continue to grow with a single digit CAGR of 7.1% during the forecast period, 2019-2025. However, the market is witnessing immense structural changes with increase in market maturity and decline in product centric sales. Just like the medical device industry, technological innovation has always been the paramount factor for success in the global OR integration systems market. However, in current times, numerous Asian vendors are catching up in the industry and existing manufacturers are extensively realising the growing mismatch between the risk and reward of product innovations. Consecutively, technological leadership is failing to be a sufficient source of competitive advantage. The global OR integration systems market comprises five distinct regional markets: North America, Europe, Asia-Pacific, Latin-America, and Rest-of-the-World. In 2017, North America was estimated to be the largest regional segment with a value of $4.09 billion and is anticipated to reach $6.08 billion by the end of 2025. The key manufacturers who have been contributing significantly to the global OR integration systems market include Stryker Corporation, Karl Storz, Olympus Corporation, Getinge, Arthrex, Canon Medical Systems Corporation (Formerly Toshiba Medical Systems), Skytron, Trumpf Medical (Hill-Rom), Brainlab, Richard Wolf, Smith & Nephew, ConMed Corporation, Fisher and Paykel, Haag-Streit, Eizo Corporation, and Leica Biosystems, among others.